Phillip Ewbank, 80 of Washburn, Missouri passed away January 24, 2018 at his home in Washburn. Cremation, with memorial services 11:00 am Saturday, April 21, 2018 at the Virginia United Methodist Church, Butler, Missouri. Mullinax Funeral Home, Butler (660679-0009). Messages of condolence may be left for the family at www.mullinaxfuneralhome.com. Phillip was born on April 20, 1937 to Perry Addison and Blanche Eva (Dunavan) Ewbank, on the Jundy Place, just two miles east of the little community of Virginia, Missouri. He was the 7th child and 5th son of a family of 10 children. He was small in stature as a child and soon earned the nickname of Peewee. His family were dairy farmers so there were always plenty of chores to do. Phillip always did his share, as well as finishing chores for his other brothers and sisters. He started his education at a small one room country school named Bethel, walking each day. In 1945 his parents purchased a farm north of Amoret, Missouri, where he went to Mulberry school, walking or riding on “old tony” with his brother, Jon. The Mulberry school closed and the children went by bus to Amoret School which included grade school and high school. The school districts of Amoret, Amsterdam and Merwin consolidated forming the Miami R-1 High School where he completed high school in 1955. Later that year, Phillip began working for Sears Roebuck in Kansas City, Missouri, living with his sister Muriel and her family, until he was drafted into the US Army. He served for two years but never was sent outside the US. He continued his education at Mt. San Angelo Jr. College and Chafee College, receiving his Associate's Degree. Phillip purchased the Ewbank homestead after the death of his father. He commented that “he didn't know just how poor he was” at that time. When he returned to civilian life, he again worked for Sears Roebuck where he worked in the Rug department cutting and dewing heavy rugs, which took a toll on his health. He underwent back surgery and began to search for another occupation. On june 7, 1963 in Montclair, California, Phillip was united in marriage to DarLene Nelson and adopted her young son, David. They established their home in Montclair, California where he found temporary work until he was hired by the US Postal Service. He delivered mail on foot for many years, then by truck, then became supervisor and trainer, sorting many pieces of mail each day. He enjoyed meeting all the patrons on his routes. Phillip and DarLene took care of several Foster children in their home. One became very special and soon they adopted Eva Marie. This made their family complete. Eva was a fun loving, happy little girl plagued with Diabetes, which made their life more complicated. Eva was Phillip's pride and joy! Phillip and DarLene traveled to Missouri for many family gatherings and special events. They were usually the first guests to arrive. Family was a “Big Deal” for them. They also entertained anyone who could venture to California for a visit. Phillip enjoyed showing the sights and taking guests to a fine meal. 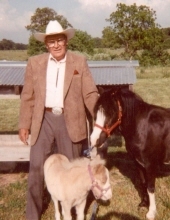 The dream of retirement and having a Miniature Horse Farm began to develop for them. In 1993 Phillip took early retirement offered by the postal system and moved to a small farm at Washburn, Missouri. In a short time, he took up a night Custodian job for a school in Arkansas, where he put in many night hours while working to make their farm dreams come true. They purchased some good stock, soon had a buggy and enjoyed taking a docile pony to the Rest Home nearby at Christmas time. They were active members of Church of God Seventh Day Adventist for many years. DarLene, the love of his life, passed away in 2010. Phillip was so proud of his two granddaughters, Jaclynn and Heather. Step-granddaughter, Nacole and great grandson, Braelyn. He loved their visits and especially the times he went to their homes. Family was very precious to him. Phillip had a passion for anything country and Louis Lamore's western novels. He had a complete set and shared them with anyone that would take one home with them. He enjoyed being with his siblings to hear and tell stories of the earlier days with the family. He was a very happy man when his son, David and daughter-in-law, Lori, moved from California to Washburn. As time went on, they found him a special dog named Buddy. Lori made him many nutritious meals and cleaned his house; David would stop in almost every day, they helped him keep the grass mowed and took him to many doctor appointments and hospital visits. Several times they took him to Silver Dollar City or Branson for a day's outing. He loved life and lived it to the fullest! Phillip was preceded in death by his parents, wife Darlene, one daughter, Eva Marie Ewbank; two brothers and one sister. Surviving are one son, David Ewbank and his wife Lor of Washburn, Missouri; three brothers, Harold and Don both of the Kansas City area and John of Tennessee. Three sisters, Muril, Shirley and Janie all of the Kansas City area; two granddaughters Jaclynn and Heather; one step-granddaughter, Nacole and one great grandson Braelyn. To send flowers or a remembrance gift to the family of Phillip Ewbank, please visit our Tribute Store. "Email Address" would like to share the life celebration of Phillip Ewbank. Click on the "link" to go to share a favorite memory or leave a condolence message for the family.